NASA pictures of Comet photos show that meteors and comets in space compress and ionize the gas in space that is front of them, leaving the comet tail behind them. As the previous pages indicate, gas in space causes the red shift and slowing of the speed of light. 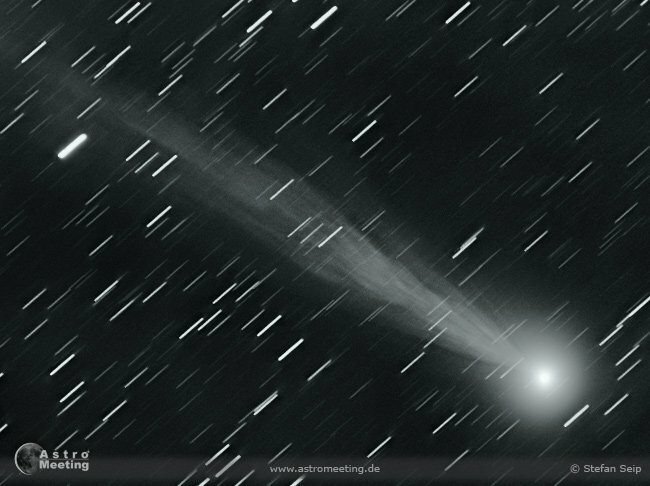 Photos of the comets Hale-Bopp, Hyakutake, Schwassman Wachman and other comets, meteors and asteroids clearly show that the tails of comets, meteors and asteroids are not really physical matter leaving a trail for a million or so miles behind them, but are actually a trail of gas in space ionized as the comets raced through it. The photos clearly show the gas being ionized in front of the comets as the comets compress the gas in front of them. We also know that the tails of comets in space go away from sun because of neutrons and alpha particles shooting out from the sun as the comets pass the sun. Clearly, the tails do not swing millions of miles around in space as the comets pass the sun! The tail is not dust and debris from the comets, but ionized gas due to the compression of gas in front of the comets, the static electricity caused by the friction of the comets against the compressed gas, and the stream of atomic particles from the sun ionizing the compressed gas. NASA photo of Comet Hyakutake is compressing and ionizing space gas in front of it, leaving a tail of ionized gas a million miles long. Note that the tail of the comet is not all behind the trajectory of the comet, but is away from the sun due to solar wind, which was on the opposite side of the earth at the time this picture was taken. This photo proves the existence of ever-increasing gas in space, slowing the speed of light. At the time of creation, space was a perfect vacuum, and transfer of light from stars to the earth was instantaneous. Thus we have the Scripture Job 38:6 - 7, "Whereupon are the foundations of the earth thereof fastened? Or who laid the cornerstone thereof; when the morning stars sang together, and all the sons of God shouted for joy (KJV)?" 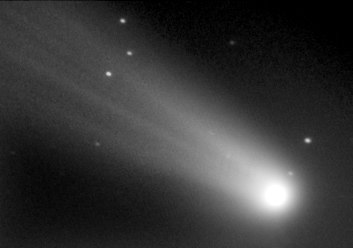 NASA photo of Comet Hale Bopp shows ionized gas in space in front of its trajectory. The following links show ionized gas in front of other comets, which explains the red shift and the slowing of the speed of light in space as space fills with more and more gas. Photos of comet Hale Bopp, comet Hyakutake, comet Schwassman Wachman and many others show that comets in space compress and ionize the gas in space that is front of them, leaving a comet tail of ionized gas behind them. Gas in space causes the red shift and slowing of the speed of light. This brings us to more evidence about red shift: the red glow on earth at sunrise and sunset. We have been taught that this red glow is because the atmosphere bends the light rays, causing red to go down toward the earth and blue to go up to the sky. Oh? Where are the orange, yellow, green and violet? If the light is refracted or bent, we should be able to see the missing colors from an airplane, or at least from a satellite. The truth is, satellites do not see a blue sunset on the earth; the same red glow on earth is seen from satellites as the velocity of light is slowed by earth's atmosphere. There are no other colors. The red glow is more probably a slowing of the speed of light as it passes through more atmosphere than it passes through when the sun is above us. During an eclipse of the moon, as the light from the sun passes through the earth's atmosphere to the moon, we see the moon turn red; not blue.